Open government is grounded in the belief that access to government information is essential to the functioning of democracy. In the United States, information-based strategies to promote open government began with the Constitutional rights to free speech and a free press, and later extended to public meetings laws that require government to conduct its business in open venues. In the 1960s, information-based strategies such as freedom of information laws further established the public’s right to know and set the rules for gaining access to most government records. Efforts to broadly open government information began in the 1990s with the introduction of electronic government initiatives that turned the focus toward creating electronic access programs, electronic records programs, and thousands of government Web sites. Two major outcomes of these initiatives include the federal Web sites Fedstats.gov and Regulations.gov (see side box). A decade ago, the federal statistical agencies joined together to improve their data products and provide ancillary information and tools to help users take advantage of them. The result? Fedstats.gov, which provides access to thousands of data sources and reports on 400 topics provided by more than 100 organizations, including units of the Departments of Commerce, Labor, Justice, and Agriculture. The collection and digitization of land records and associated geospatial data organized in state- and national-level data repositories such as the Spatial Data Infrastructure and the New York State GIS Clearinghouse provide access to standardized spatial data for a variety of uses. Planners, police, emergency services, assessors, school officials, real estate professionals, and many others take advantage of this information in different ways to do their work. Information-intensive processes have also contributed to open government. In the early 2000s, Regulations.gov started as part of an extensive electronic rulemaking initiative intended to provide citizens, businesses, advocacy groups, researchers, and lawyers with electronic information and tools to find proposed regulations, submit comments, do independent analysis, and track the progress of rule development. Extensive back office changes in the rulemaking process, still in progress, are an essential part of this effort. In 2006, new efforts to package information content for public use in order to answer a fundamental public accountability question—where do federal dollars go? started with USAspending.gov. The Web site is a single, searchable repository for all federal spending and was intended to organize government data from many different sources. The site is frequently updated and summarizes federal spending in major categories, provides an IT dashboard for major technology projects, identifies the top government contractors and assistance recipients, and links to procurement information and related resources. Most recently, the Obama Administration has combined and augmented these approaches with additional information-based efforts to make government more transparent. The administration’s Open Government Directive requires federal agencies to post previously internal electronic datasets for public use on a new governmentwide site, Data.gov. The Directive also requires every executive branch agency to create an Open Government page on its site that makes its mission, activities, and results more visible and understandable to the public. 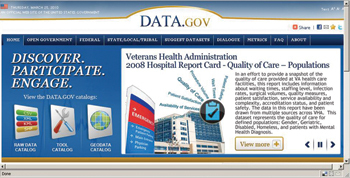 These pages often provide reports, service summaries, links to major programs, downloadable datasets, and online public dialogs. These initiatives do more than open government to public scrutiny; they actively encourage businesses, civic organizations, and individuals to make innovative use of government information for their own purposes. Additionally, spending associated with the $787 billion American Reinvestment and Recovery Act (Recovery Act) has been made available through a single Web site. Recovery.gov is designed to collect and display to the public frequently updated data; it is the first effort of its kind to collect spending and performance information across a variety of program areas and levels of government, including the private sector. While traditional Web sites play an essential role, many government organizations are also experimenting with and adopting blogs, wikis, and other Web 2.0 tools to encourage public engagement. Moreover, while only federal-level executive branch agencies are required to provide data sets to Data.gov, participate in e-rulemaking, and follow the Open Government Directive, the effect reaches much further. States and municipalities are creating similar data dissemination and access programs, and are participating in real time reporting and data coordination roles that show up, for example, in quarterly updates about state, municipal, and contractor spending on Recovery.gov. Renewed emphasis on opening information to the public, plus the evolving capability of the technological tools for doing so, offer many opportunities to contribute to the goals of open government. Past experience and research findings tell us these initiatives are fraught with challenges, but they also offer useful lessons for this new phase of informationbased transparency. Research at CTG has been addressing these challenges since the early 1990s (see side box). CTG’s development of a spatial data clearinghouse prototype revealed the critical importance of standards and metadata, search capabilities, and cross-boundary collaboration, as well as the essential value of designating authoritative sources for key datasets. This project highlighted the challenges associated with a shift from providing the public with reports and statistical summaries about the status of children to providing the actual data that underlies them. Making the data available brought with it the need to understand the processes that produce the data and the development of new skills and services to support data users. CTG’s analysis of the production and use of parcel data demonstrated the need for coordinated policies across different levels of government as well as appreciation for the ways in which a broad range of users created many different applications with value for public, private, and civic purposes. All of CTG’s findings from designing public access programs were pulled together into a toolkit that helps government organizations understand the complex, multi-dimensional nature of information access. 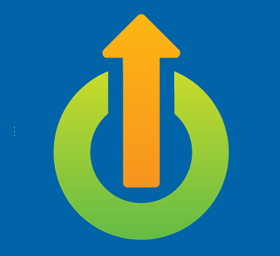 CTG’s Gateways Guide leads access providers through a process of assessment and design that focuses on uses, users, policies, data characteristics, and organizational factors to define and build successful programs. This body of research emphasizes three factors that are necessary for using information to help achieve open government. First, information presented to the public needs to take a variety of forms so that all kinds of potential users are served. Second, regardless of form, the information must be both useful and usable to deliver its intended value. And third, the production and release of meaningful and usable public information must become ingrained in the regular operations of government organizations. Different stakeholders need and want a range of information in a variety of forms to suit their own purposes. Statistics, machine readable datasets, clearinghouses, official reports, and program evaluations all have their role and value in information-based strategies. A citizen may want to quickly review the total spending of a program or want access to the voting records of elected representatives. A think tank might want large digital datasets for policy analysis in its area of expertise. An entrepreneur could want real time data feeds to incorporate into a new commercial information service. Advocacy organizations may need reports and analysis prepared by government experts to help them persuade others to support their views. Clearly, these different kinds of uses and users cannot all be served by the same kind of information. 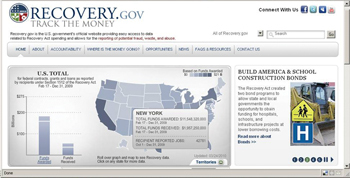 Sites like Recovery.gov use sophisticated search capabilities and graphics to display the information content. The site caters more to those who want summary-level information quickly than to those who want to analyze the data themselves. Agency-specific open government pages provide many different kinds of information in the context of agency missions. Fedstats.gov and Data.gov are more focused on quantitative data, although both also offer some analysis and narrative information. Providing useful and useable data to the public means paying attention to users’ needs and understanding the challenges of ‘fitness for use.’ The current emphasis on electronic access through Data.gov focuses especially on raw, machine-readable information about government finances, program performance, and decisions. The goal is to allow people and organizations outside government to find, download, analyze, compare, integrate, and combine these datasets with other information so that they provide greater value to the public. However, it is important to remember that many government datasets are defined and collected in different ways by different government programs and agencies. They come from a variety of different systems and processes and represent different time frames and other essential characteristics. While quickly getting data out in the open is an important goal, the value, or ‘fitness,’ of the data for any particular use depends on making these characteristics easy to find and understand. Whether in machine-readable formats, statistical summaries, graphical representations, or analytical reports, users need to know the context of the information provided. This includes providing data definitions, advice about how to use the data, and descriptions of its limitations. The information also needs to be organized by topic, time period, or other useful schema that allow users to find it and then share, use, and manipulate it in valid ways. For most government agencies, providing information for public use is an extra responsibility that may compete for resources with the demands of mission-focused operations. While vast amounts of useful information are contained in government data systems, the systems themselves were seldom designed for use beyond the agency’s own needs. The exceptions are the agencies whose mission is information collection and analysis, such as the US Census Bureau or the US Bureau of Labor Statistics, or those with responsibilities to maintain the authentic historical record of government such as the National Archives and Records Administration. Permanent birth, death, and land records are maintained in their counterpart organizations in state and local governments. But for the great majority of government agencies, making data holdings available to the public in a meaningful and useable way is a new responsibility that will often need thoughtful investments in skills, tools, and policies, as well as some changes in processes and practices. Understanding the public value proposition of informationbased strategies to open government requires us to look at them from multiple perspectives. Open government is more than opening information, it is about opening the information about what government does and how it does it to the citizens and stakeholders that need and want it. Information access and dissemination are necessary to transparency and public accountability. They are also complex and dynamic responsibilities that demand supporting policies, tools, and skills for success.